Discussion in 'The Beat of The Brass: Herb Alpert/Tijuana Brass' started by Harry, Mar 18, 2013. In the mid 1960's, Herb Alpert And The Tijuana Brass were arguably the hottest act in pop music. They were the only act to ever have four albums in the Billboard Top 10 at the same time. In 1965 they dominated the number one spot for eighteen weeks which is longer than any other act. From 1965 to 1968 they earned twelve gold albums including five that reached number one. Even if you didn't own a record player, it would have been nearly impossible to escape their sound. From Emmy nominated TV specials, to theme songs for television shows, to commercials and main title songs for motion pictures, and especially the radio where you were likely to hear one of their fourteen top 40 hits. By the mid 1970's the Tijuana Brass disbanded and Herb moved on to a new direction. "Rise" was the 1979 instrumental that put Herb back in the number 1 spot on the charts and back in the Grammy winner's circle. It signaled a new sound that carried Herb Alpert into the top 10 on both the pop and R&B charts for the first time. Herb's drive to stay contemporary also extended his musical appeal to the prevailing trends of the day without ever compromising his signature sound or artistic integrity. Herb Alpert's emphasis throughout his career has been on experimenting with new sounds and yet never abandoning the easy listening approach. His music is mellow and dynamic and has an appeal that transcends the generations from The Lonely Bull, through Whipped Cream, past Rise and Fandango and to the latest release Passion Dance, Herb Alpert has shown that great songs, a special care for the arrangements and broad and varied instrumentation make him the universal artist of our time. Rondor Music would like to thank all of the writers and musicians who contributed to creating this great music. We also want to thank A&M Records and Almo Sounds for allowing us to use these recordings. Since this set isn't exactly an A&M release, it'll never be included in our numerical Album Of The Week recognition. It was a promotional release from Rondor, the music-publishing arm that Herb and Jerry owned at the time, and it was "released" in 1997 and sent to movie makers, TV producers, etc., in an effort to get them to license the music for their productions. 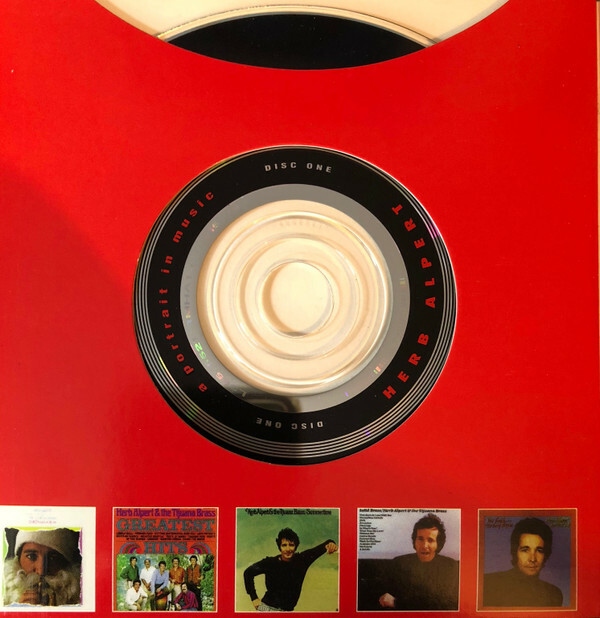 The title was a 2-disc CD set, packed in a four-panel foldout cardboard case, with the discs housed in pockets in the first and fourth panel, track list inside, notes on the foldover, and little pictures of all of the the Herb Alpert albums along the bottom of each page, five to a page. Scans of the front cover will never do it justice, as the black panel on the left actually contains a watermarked image of half of Herb's face. I added this thread today because I stumbled upon an interesting factoid today about one of the tracks. "Push And Pull" on the second disc sounded a bit odd as I played it today, and after close examination, I find that the track is a mono mix instead of the standard stereo mix from FANDANGO. It's not 100% pure mono, as the left-right tracks aren't perfectly identical matches, and if you do an OOPS stereo playback, you'll hear snippets drifting in and out of phase. But the track is mono for all intents and purposes, and even has a little bit of a different sound, like it has a touch of reverb added. The "Push And Pull" track wasn't released as a single (it DID get a release as one of four FANDANGO tracks on a 12" promo) so I find it odd that a separate mono mix would even exist. Furthermore, it's odd that the compilers of the PORTRAIT CD would have used a mono mix. All of the other tracks are stereo, with "Mexican Shuffle" getting its usual sort-of mono treatment. This is a pretty cool collection. 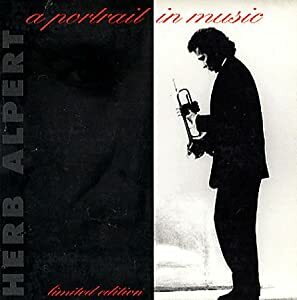 I don't think there are any other collections that shuffle the various periods of Herb's career the way this one does -- but since all the tracks have the common thread of the trumpet it would be great listening anyway. I found it interesting that Disc 2, Tracks 5, 6, 7, and 8 seem to be in alphabetical order, though other titles would have fit in there too, like "Spanish Flea". How is it sound-wise? Since they mix '60s tracks in with tracks from the 2000s, the sound/production differences could be pretty jarring -- is it equalized pretty nicely? That's one thing I've never been able to do when making compilations -- a newer track always seems to jump out more than an older one. I attribute it mostly to better recording techniques today. It's actually not too bad at all. There will always be a clash of recording styles when you go from old to new and back. Some of the transitions sound decent, others clash. It's hard to make a transition from the ricky-ticky "Acapulco 1922" to the modern-Latin "Passion Dance" without a noticeable jump in both styles and quality. I was really surprised to hear "Push And Pull" sound different from what's current on the new FANDANGO remaster, and then finally realize it's in mono. Just received it brand new/sealed from ebay for $5.99 (not a typo). Says 2 are still available. I saw that listed there and remembered what a fevered rush there was to acquire one of these 20 years ago. Of course that was before Herb Got His Masters back and much of these songs were unavailable on CD but now today this Collection seems unnecessary with everything now Availible on CD and Downloads with the exception of the mono mix of Push and Pull and maybe a few other differences What a Difference 20 years can make. I decided to snag one of those off of eBay considering it's not only $5.99, but has free shipping to boot! There are a few tracks I don't already have, plus that mono "Push and Pull," plus the cool looking cover, pushed me over the edge. I don't suppose it contains the "wet" version of "Brasilia?" Nah, that'd be too much to hope for. and digipak packaging in 1997 .... ahead of its time. "Digipak-style cases grew in popularity among record labels and recording artists in the early 2000s"
- according to the always reliable source (joking) Wikipedia. PORTRAIT is not "digipak". That is a special kind of holder where a plastic covering and hub are pasted onto a cardboard inner face. PORTRAIT has pockets where the CDs fit inside.